When Summer rolls around, I can’t help but get in the mood to be more adventurous with my makeup looks. I’m currently loving the cat eye look that seems everyone is wearing these days, but I always found them to be a bit too complicated and time consuming. Fortunately, with a little experimenting, I found a minimal, simple way to create one that’s just striking, using a combo of smudged out pencil eyeliner and a bit of eyeshadow. For my look, I used all Rimmel products, which I picked up during my last trip to Walmart. My objective was to only get a new black eyeliner, but considering how budget-friendly their products are, I ended up getting a bunch of stuff, including a couple of eyeliners, two eyeshadow sticks, mascara, foundation, and a gorgeous new lip shade. As soon as I got in the car after my shopping trip, I started playing with all the makeup and ended up creating this look – hence why it includes everything I picked up! I loved the cat eye look so much that I’ve been wearing it every day now. Best of all, it takes me almost no time at all and there’s little room for error (heck, I was able to do it in twilight lighting in my car!). 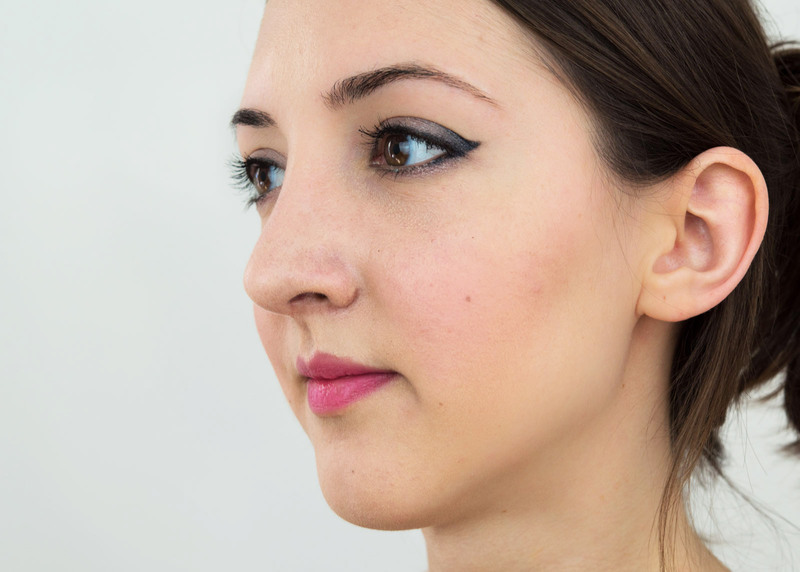 I find it to be super easy when you’re using pencil eyeliner versus liquid liner – they make for a sultry, edgy look but are also nearly foolproof. So if you’re interested in learning how to do a cat eye using pencil eyeliner, here’s a little tutorial that will hopefully help you out! Let’s begin with foundation. Whenever I do a bold look that emphasizes my eyes and lips, I like to tone down my face, keep it simple, and perfect it. That means no intense highlights, blush, or contouring – just a flawless face with a matte finish. Here I’m using the Rimmel Stay Matte Foundation. It’s perfect for creating a matte base and keeping it matte by providing all day shine control (which is especially great during these warmer months). The oil-free foundation provides excellent coverage too, while feeling lightweight and super smooth on the skin. I used my Sigma F84 brush to apply it. Goodbye redness, hello smooth, flawless finish! To finish the face, add some concealer, followed by a bright peachy pink blush to the cheeks. Apply a shimmery champagne color all over the lids. Here I’m using the Rimmel Scandaleyes Eye Shadow Stick in ‘Bluffing’. Grab a black pencil liner – one that’s going to last all day, preferably waterproof. Here I’m using the Rimmel Scandaleyes Waterproof Kohl Kajal Eyeliner in Black. 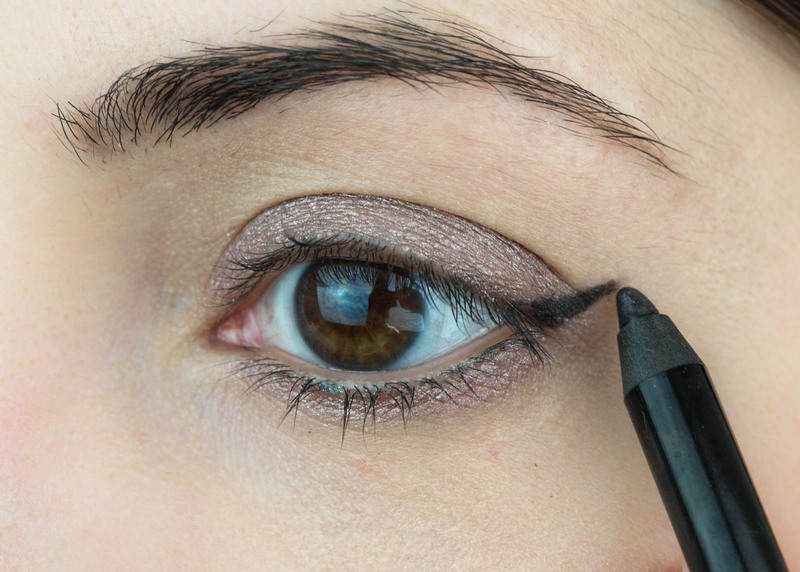 Using the liner, draw a line at an angle toward the very end of your eyebrow. Keep it going until it hits just slightly past the crease. Then, from the end of that line, draw another line going straight in. Stop when you hit the crease. 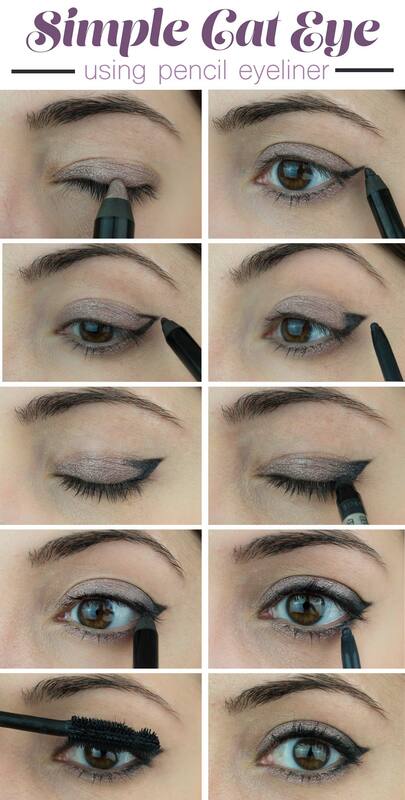 Fill in the little angle with a dark grey eyeliner or shadow. Here I’m using the Rimmel Exaggerate Waterproof Eye Definer in ‘Earl Grey’. It’s a dark grey with some extra shimmer that pairs well with the base shimmer shadow. Take the eyeliner a little into the crease and along the outer top lash line as well. Next, smudge out the shadow/liner using a small, stiff eyeshadow brush or smudge stick to blend it in with the base eyeshadow (I used the end of the Rimmel eye liner pencil – it’s very handy!). Finally, grab the black eyeliner again and tightline the top lash line. Then grab the grey and fill in just the outer 1/3 of the lower lash line. Finish with a lengthening mascara. Here I’m using the Rimmel Scandaleyes Show Off Mascara. To finish the look, go for a bright lip. Here I’m using the Rimmel The Only One Lipstick in the shade “You’re All Mine”, which is a gorgeous blue-toned pink. I absolutely love the way these Rimmel lipsticks feel on the lips: they’re ultra-pigmented yet feel so lightweight and moisturizing on the lips. And then we’re all done! I hope you enjoyed this tutorial! Hopefully it helps make those cat eyes a little bit easier to do in the mornings. This particular look takes only about 2 minutes to do, and with the right products, it will last you all day. Using the Rimmel shadows and liners I featured here, this look lasts 12+ hours on me. The Rimmel Stay Matte Foundation has incredible staying power, too, and keeps my skin completely matte for 8+ hours too. If you’re looking to create your own look, I highly recommend checking out Rimmel makeup. They have makeup to create any look, from natural to bold – no matter your style. What are your favorite ways to play up your makeup looks? 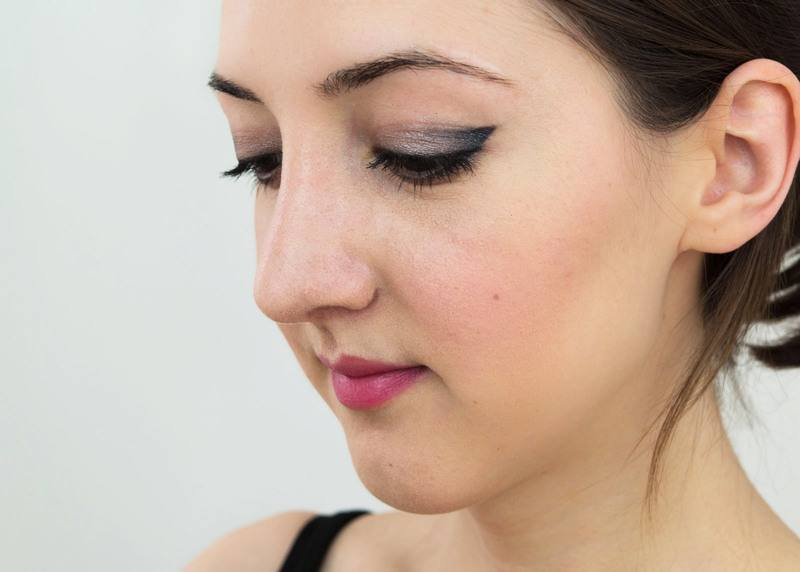 Is the cat-eye part of your everyday look? Next Post Perfectly Posh Review | It’s Pampering Time!